Laboratoires OSMA handmade for more than 50 years natural alum stones. Laboratoires Osma only selects high quality alum cristal, in order to purify it and to shape it in our warehouse. 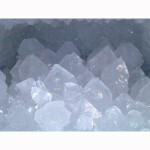 All this production steps will permit to obtain one of the best alum stones in the world. Thanks to this cosmetic know-how, Laboratoires Osma also offer a large range of traditional and organic cosmetics. 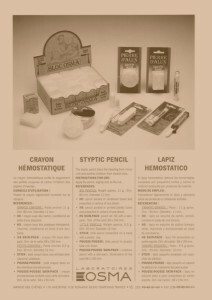 Based in Lyon area, Laboratoires Osma still made all this products in France. Form its creation until the beginning of 80’s, Laboratoires Osma offers essentially shaving products. Once its alum stone was well known for its quality, Laboratoires Osma decide dot diversify their products by offering an haemostatic pencil dedicated to small shaving cuts, and more adapted to a personal use. This pencil shape is still the same today, cause it made its use more easy and more comfortable. It’s form the half of the 80’s thanks to a new manager, that Laboratoires Osma decided to exploit alum deodorant’s properties. 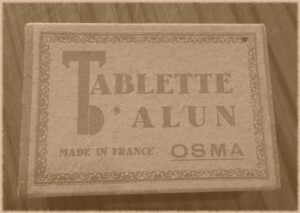 Made by hand with a “raw” design, Laboratoires Osma begins by offering 2 alum blocks that weights 150 and 250g. 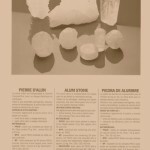 By the beginning of the 90’s, and in the following years Laboratoires Osma will develop different alum stones’ shape, for offering more comfortbale use, and they will also develop a lot of cosmetic formulas that will integrate alum stone as an ingredient, to offer to the consumers the whole benefits of alum stones. Thanks to its experience and its unique know how, Laboratoires Osma is able to offer nowadays complete cosmetic’ ranges mainly dedicated to hygiene, and well known for their quality and their large part of natural and organic ingredients. It is through its manufacture, but also of its brands ( Aluna , Osma Tradition … ) that Laboratoires Osma make available a full range of natural and organic cosmetics.